Some, but not much progress today. Ann is still playing at it. 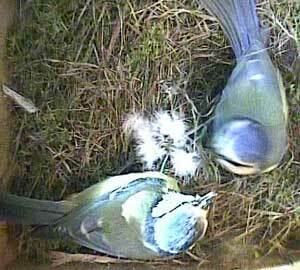 When she wants to, a bluetit can build an entire nest in 2 or 3 days! This looks better. The box is getting steadily fuller, albeit rather slowly. 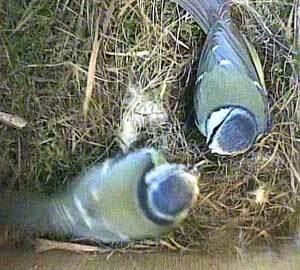 Still, most birds don't start laying their eggs until well into April! In Box2, things are still progressing, albeit somewhat slowly. 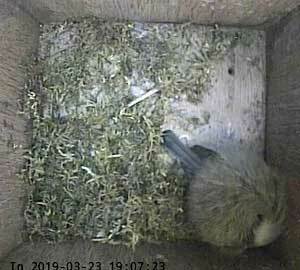 Here Bella has brought some feathers into the nest box for the first time. So she must be thinking she has nearly finished. There seemed to be a lot going on in Box2 today, so I counted the number of visits Bella made during the day. 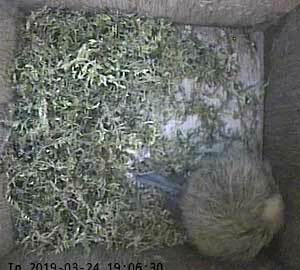 Between 8am and 6pm she made over 40 visits to the nest box. Often she was bringing nothing into the box, and did little save for a nesting wriggle. 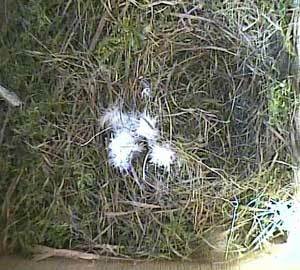 However, Ben was also very active and sometimes preceded her into the nest box. This is one such occasion. Ben, who was in the nest box first, is to the upper right, and Bella is in the bottom left of the picture. This is another swap over some three hours later. It is interesting to see how similar the two change-overs were.